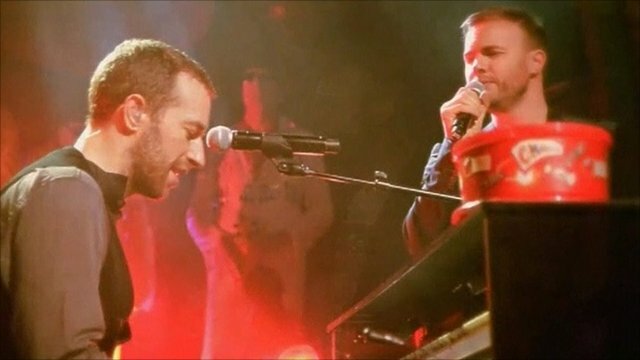 Coldplay and Gary Barlow do secret gig Jump to media player Coldplay and Take That's Gary Barlow have performed together in a secret gig in Liverpool to raise money for the homeless charity, Crisis. Williams re-joins Take That Jump to media player Take That have confirmed they are back together. They have recorded a new album which will be released in November. Coldplay and Take That's Gary Barlow have performed together in a secret gig in Liverpool to raise money for the homeless charity, Crisis. They were joined on stage with the Choir With No Name, which includes homeless people among its members on Sunday, with a second concert in Newcastle on Monday. So far £238,000 has been raised for the charity by the concerts.